Manages Configurations for Point Servers and Point Managers. Collects data from Point Servers and Point Managers. Manages hundreds of Point Servers and Point Managers – expandable to thousands. Uses Ethernet (TCP/IP), Dialup modem and Serial Port to communicate. TCP/IP and modem connections are limited only by the resources of the computer. Scheduled polling of Point Servers and Point Managers. Receive asynchronous connections from Point Servers and Point Managers to collect alarms and data. Alarm annunciation through popup window, sound and email received alarms. Organize Point Servers/Point Managers in a tree structure. PointWare is a program used to maintain Point Servers and Point Managers. 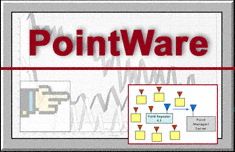 PointWare provides a graphical interface to common Point Server/Point Manager configuration and data gathering tasks. PointWare simplifies the setup and management of Point Server/Point Managers. PointWare makes connections with Point Server/Point Managers, reads the data and places the data in a database on the computer. PointWare can display alarm and data reports. PointWare can make connections with a Point Server/Point Manager using the three supported media: TCP/IP, Modem and Serial Port. PointWare can both initiate \Relate "PointWare.DOC!2", "push" \D2HTargetDefault and answer \Relate "PointWare.DOC!17", "answer" \D2HTargetDefault multiple simultaneous connections. The user can set up PointWare to use the available communication resources on the PC (Ethernet, Modems, Serial Ports). PointWare manages each Point Server/Point Manager's configuration. The setup interface allows viewing and editing of Point Server/Point Manager information that is stored in the database. All the functions of the Point Server/Point Manager are supported in the setup interface. PointWare monitors configuration integrity between the database and the Point Server/Point Manager. PointWare gathers stored data in the Point Server/Point Manager’s Historical \Relate "PointWare.DOC!21", "Historical" \D2HTargetDefault and Event \Relate "PointWare.DOC!22", "Event" \D2HTargetDefault Logs and places it in the database. PointWare will only gather the latest data that is not found in the database. All data, both collected data and configuration data is stored in a Microsoft SQL Server database. An action \Relate "PointWare.DOC!25", "action" \D2HTargetDefault list can be setup so that when the software connects to a Point Server/Point Manager whether initiating the connection or answering the call, PointWare will implement those individual actions against the Point Server/Point Manager. PointWare also includes a scheduler \Relate "PointWare.DOC!11", "scheduler" \D2HTargetDefault so that PointWare can make a connection to a Point Server/Point Manager at a specific time and implement the action list. PointWare contains several built-in reports that show activity of Point Servers/Point Managers, received alarms, collected events and trends of the collected historical data. PointWare shows sensor data as a line graph (sensor reading versus time). The selected data used to generate the graph can be exported as an Excel, Access, ASCII text, HTML or XML file. Third party software such as MS Access, MS Excel and Crystal Reports can be used to generate custom reports by querying the database directly. PointWare will show all collected Alarms since the last acknowledgement. An operator can then view all reported alarms collected by Point Server/Point Manager, from overnight for example. PointWare can also email these same alarms to multiple email recipients when the alarms are received. PointWare can be run on multiple computers on a network where PointWare references a central database. Different responsibilities then can be assigned to each instance. The system can then grow as more Point Servers/Point Managers are added to the system. For example one instance of PointWare can answer calls through several modems, the 2nd can poll Point Servers/Point Managers through modems and 3rd can manage TCP/IP connections. All instances can choose whether or not to display or email alarm notifications.